Our research links basic science with clinical applications and focuses on understanding the mechanisms behind tumour resistance to radiation. The main goal of our research is sensitising cells to radiation by blocking mechanisms that control cell survival. Specifically we are interested in oncogenically activated signal transduction pathways that exert a radioprotective effect on tumour cells. The effectiveness of radiotherapy treatment could be significantly improved if tumour cells could be rendered more sensitive to ionising radiation without altering the sensitivity of normal tissues. In the past, our research has shown that the EGFR-Ras-PI3K-PTEN-Akt pathway appears to be the major radioprotective pathway active in most solid tumours, and therefore this pathway presents targets that could be manipulated in a clinical setting to modify the radiation response. We have shown that a specialised DNA repair enzyme, DNA polymerase theta (POLQ), is overexpressed by tumour cells and that depletion of this enzyme makes cells more sensitive to radiation. Importantly, normal healthy cells do not appear to express POLQ and are therefore not affected by its inhibition. 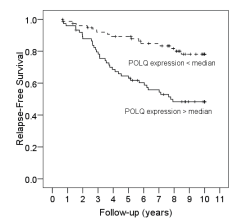 We also found that patients with high levels of POLQ expression have a worse prognosis. This would make POLQ an ideal therapeutic target for improving the effectiveness of radiotherapy without increasing normal tissue toxicity. We are also interested in improving radiotherapy by reducing tumour hypoxia (low levels of oxygen in the tissue). One of the main reasons for the resistance of tumours to radiotherapy is the presence of large hypoxic regions that are significantly more resistant to radiation. One way of alleviating tumour hypoxia is to reduce the oxygen consumption of the fast growing cells at the tumour periphery so that more oxygen becomes available to the hypoxic regions. A high-throughput screen conducted by our laboratory identified drugs that reduce oxygen consumption in tumour cells that could be used clinically to reduce tumour hypoxia. Figure 2. A drug identified by our laboratory that reduces hypoxia. The graph on the left shows the reduction in oxygen consumption following treatment with the drug in tumour cells grown as a monolayer. The panel on the right shows the reduction in the hypoxic core of tumour cells grown in spheroids, which mimic solid tumours. After 24 hours of treatment with this drug, the hypoxia in the centre of the spheroid is completely abolished. Overexpression of POLQ confers a poor prognosis in early breast cancer patients. Tumor vascular changes mediated by inhibition of oncogenic signaling. Congratulations to Dr Bart Cornelissen of the CRUK/MRC Oxford Institute for Radiation Oncology, Department of Oncology who has secured a £200k grant from UK medical research charity, Pancreatic Cancer Research Fund (PCRF).